In defiance of all international dictators with Moe Howard haircuts, I saw “The Interview.” I may have to go into witness protection. Dave finds out that North Korean dictator Kim Jong-un is a big fan of his show, when he is not threatening to blow up America. Dave reaches out to North Korea and between firing rockets toward California, they agree to an interview. As we all learned from the trailer and global controversy, the CIA asks them to kill Kim Jong-un. When the “trained” killers travel to North Korea, Kim Jong-un turns on his charm and convinces Dave he is a great guy and all his murderous psychopathic ways are just a misunderstanding. Aaron tries to stay on mission, even when they go from Plan A to Plan B to Plan See You Later. Sure, it’s a funny movie done in a smart and creative way. It may seem a little too real for the naïve North Korean audience, who do not know a farce when they see it. In fact, both countries are skewered, but I don’t think the point was balanced. The movie did not need a point, just a plot and a few gags to escape the real drama between these two countries. We make fun of guys named Kim in this country, and when they threaten to destroy us, we make fun of killing them. That’s what we do – instead of actually killing them. Rogen and Franco are becoming the nouveau Martin and Lewis, or Crosby and Hope, and we should all hope for more from these two. What may be seen as a political comedy is elevated by the political commentary in showing how communication is still key. What if everybody could see what Kim Jong-un is really like? 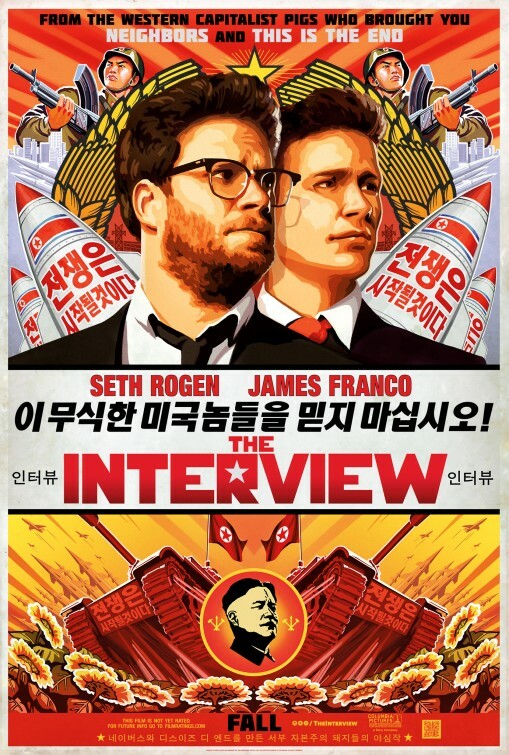 To know him is to hate him, and we might not get to know him with “The Interview,” but at least we can laugh at him. For that I must give this movie 3 ½ stars out of 5. If you don’t see this movie, the terrorists win.